When people think of Italian food, they often think of pasta, along with chicken, veal, and eggplant dishes. But there is more out there than the very familiar (and usually very good) Italian-American fare that includes such dishes as veal marsala, eggplant parmigiana, spaghetti and meatballs, and the like. Indeed, both Northern and Southern Italian cuisine can focus more on seafood, with the latter also including Sicilian fare which is heavily influenced by the sea. The Boston area doesn't have all that many Italian seafood spots--nor does it have a lot of Sicilian restaurants--but there is a place in Somerville's Davis Square called Out of the Blue that embraces both, and, now that the wonderful Pescatore in nearby Ball Square has closed, this really is one of the few games in town now for lovers of Italian/Sicilian seafood. Out of the Blue is located toward the eastern edge of Davis Square where Summer Street forks off from Elm Street. Because it sits along the very start of Summer Street (even though it has an Elm Street address), the foot traffic here is just slightly less than the part of Elm Street cutting through the heart of the square, so the restaurant is not quite as "front and center" as places such as The Burren or Mike's. Out of the Blue is also easy to miss because it is right next to The Painted Burro and The Burro Bar and almost feels like it is part of those two places, especially since the signage is not overly prominent. From the outside, the dining spot looks rather small, but the interior is actually relatively spacious because it extends pretty far back. The front has several tables set up while the middle section has a bar along the right side and a couple of rows of tables to the left, and further back there is a small nook-like area with a few more tables set up. 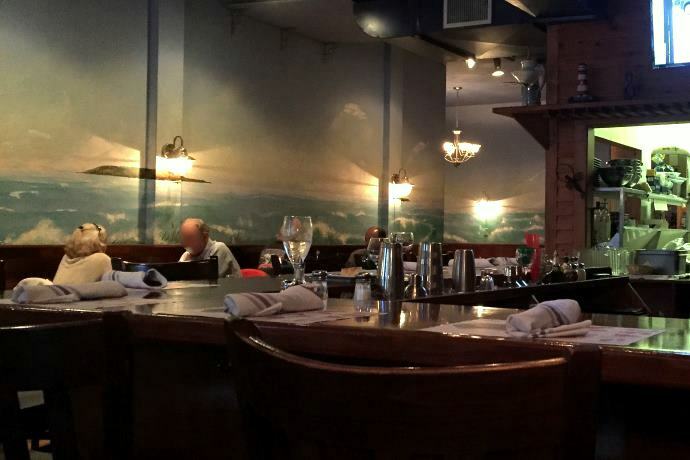 Ocean-themed murals, old-fashioned looking wall lights, and extensive use of blonde woods help make Out of the Blue a very attractive place, and it feels almost serene even when the bar area is busy. Much like Pescatore, Out of the Blue tends to focus on seafood, but there are also some options for those who would prefer non-seafood items. Starters (depending on the season and the specials offered) include outstanding crab cakes which are coated with a slightly spicy red sauce with capers; a classic New England clam chowder with local cherrystone clams and fresh clam juice; tender fried calamari (including both rings and tentacles) with marinara sauce and sauteed cherry peppers; a marvelous Caesar salad with a house-made dressing; and P.E.I Mussels in either a garlicky herbed wine broth or a spicy fra diavolo sauce. Seafood entrees abound at Out of the Blue, with the meaty grilled swordfish with potatoes and other grilled vegetables, sweet-tasting pan-roasted sea scallops with three excellent sauce options (red, white, or pesto cream) and pasta, garlic-heavy shrimp scampi in a wine butter sauce, pan-roasted salmon in a sublime cacciatore-style sauce, baked stuffed lobster with scallops and a ritz cracker stuffing, a fall-apart tender filet of sole Francaise with risotto, a fried seafood platter with haddock, shrimp, scallops, and calamari, a pan-roasted monkfish that tastes a bit like lobster but with the texture of a whitefish, and a tremendous haddock stew being a few highlights, again, depending on seasonal items and specials. Non-seafood options include dishes you might find at an Italian-American restaurant such as chicken parmigiana, chicken marsala, and pasta putanesca, the last of which does come with anchovies. Beer, wine, and cocktails are offered at Out of the Blue (with one highlight being a near-perfect Negroni) while desserts include a terrific tiramisu that has a subtle licorice flavor and freshly-made cannoli. About as impressive a restaurant as you will find in Somerville, Out of the Blue remains a true gem that does not seem to get the recognition it deserves, but then again, neither did Pescatore when it was around, so perhaps it has something to do with diners preferring Italian restaurants that lean more heavily toward pasta and meat dishes. Whatever the case, if you like Italian (and/or Sicilian) food and you also have a craving for all kinds of fish and shellfish, this humble little Davis Square spot will have to be on your list of places to try. Copyright © 2017-2019, Boston's Hidden Restaurants (www.hiddenboston.com).